There are a wide variety of Area Attractions to explore in the Tri-State area of Tennessee, Virginia and North Carolina. From Blowing Rock NC, to Bristol VA, and every place in between you will find your fill of fun or relaxation. Call ahead and Owner and Innkeeper Vikki Woods will be happy to help you build an itinerary. The Iron Mountain Inn Bed and Breakfast is located in the foothills of Iron Mountain. 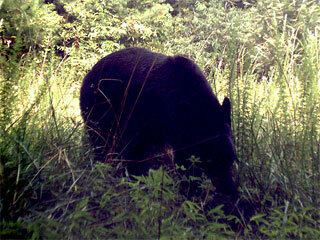 We have many people that come to this area to hike the wilderness areas around the Iron Mountain Inn’s property. View the Watauga Lake Area Map for Hiking Trail Locations and Directions. There are several hiking trails through the woods. To the left, is a map of the hiking trails near the Iron Mountain Inn. The hiking trails start and end at the Inn. Ridge Trail (Blue Line) – This hiking trail runs from the Inn across the top of the mountain ridge, then down to the Iron Mountain Inn’s entrance. Most guests hike this from the Inn to the entrance; going down the mountain, then take the driveway back to the inn. Some use the Resque Trail across from the driveway into the Creekside Chalet. 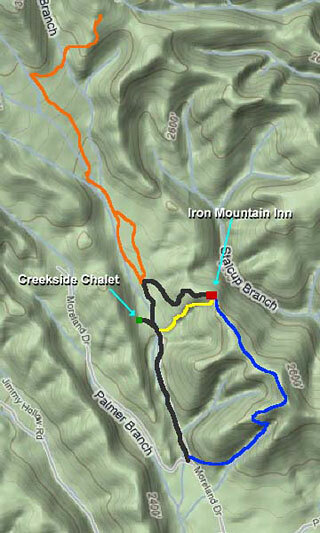 Resque Trail (Yellow Line) – This hiking trail goes between the Iron Mountain Inn and the Creekside Chalet. The trail starts a little steep then flattens the farther you go down. Creek Trail, Laurel Trail, and Cherokee Trail (Orange Line) – These hiking trails are used for hiking going into the forest on Iron Mountain. The Orange Line connects to The Appalachian Trail. The Appalachian Trail is a 2,184 mile long hiking trail that traverses the scenic, wooded, pastoral, wild, and culturally resonant lands of the Appalachian Mountains. 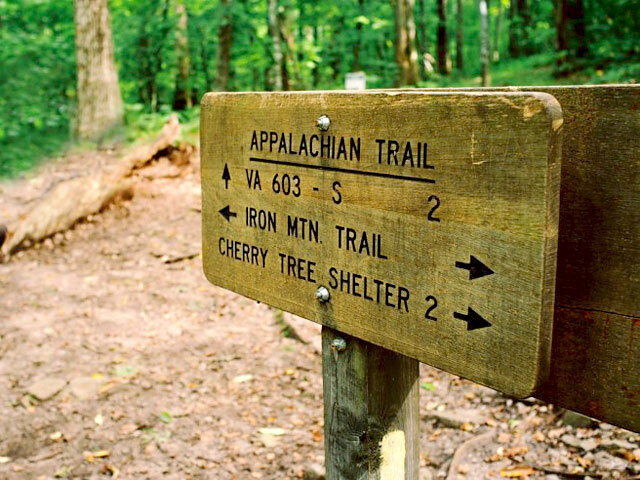 Conceived in 1921, built by private citizens, and completed in 1937, today the Appalachian Trail is managed by the National Park Service, U.S. Forest Service, Appalachian Trail Conservancy, numerous state agencies and thousands of volunteers. Hiking Trails from behind The Iron Mountain Inn Bed and Breakfast connect to The Iron Mountain section of the The Appalachian Trail. Watauga Lake Winery in Butler, Tennessee produces wine for every palate. From a dry Seyval and Merlot wine to a sweet dessert wine. The Watauga Lake Winery is a only a few miles around Watauga Lake from the Iron Mountain Inn Bed and Breakfast, so if you don’t want to drive after an event, just let us know as we will provide shuttle service. Also visit the Villa Nove Vineyards. Enjoy A Taste of Tuscany in Eastern Tennessee at this perfect wedding venue. Watauga Lake Winery is located at 6952 Big Dry Run Road, Butler TN 37640. 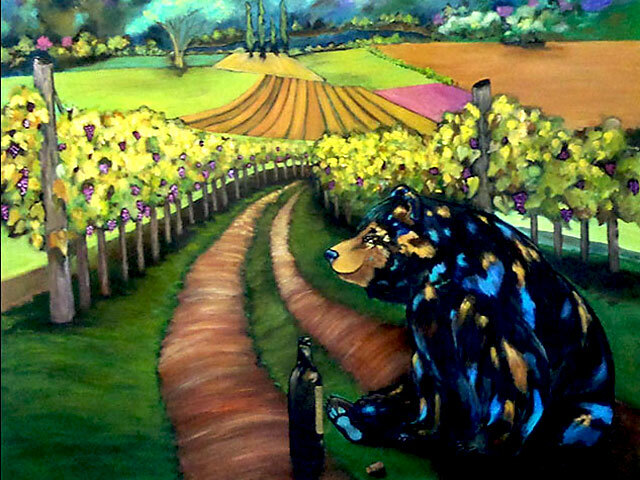 Call 1-423-768-0345 for Winery Tours. Doe Mountain is the best recreational area for hiking, ATV riding, and mountain biking within the three state area of Boone, NC, Mountain City, TN and Damascus, VA. One of the highlights of a trip on Doe Mountain is the Kettlefoot Fire Tower. There is a 3 state view from the top. Donations are accepted to make the Fire Tower safer. 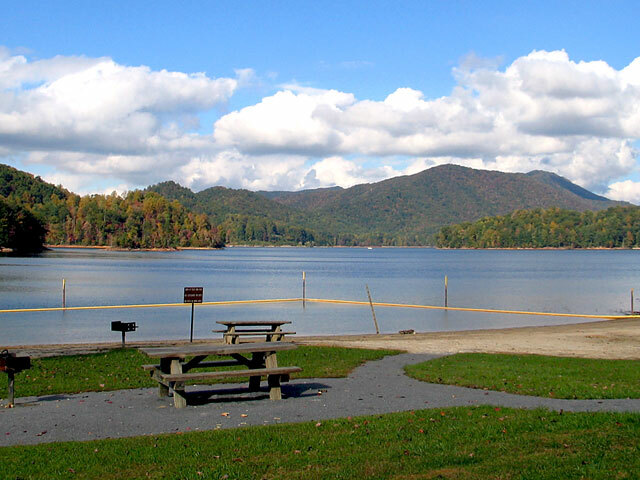 Fish Springs Marina is a full service boat rental and slip rental business at beautiful Watauga Lake. View the Watauga Lake Area Map for Attractions and Directions. 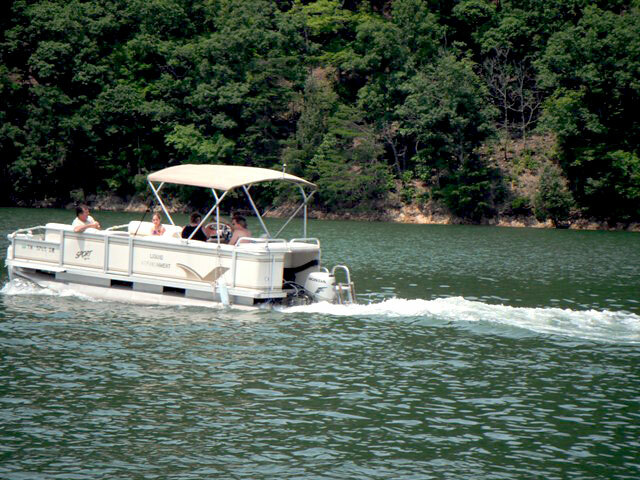 Rent a pontoon boat and enjoy a picnic in the middle of Watauga Lake floating gently along, or pull up in one of the coves or islands and explore. Jump off the side of the boat and enjoy a refreshing swim in Watauga Lake, the third cleanest lake in the US. Rent stand up paddleboarding, kayaking, canoeing as well as pontoon boat rentals. Also fishing guides – Maybe catch the elusive 300lb carp! 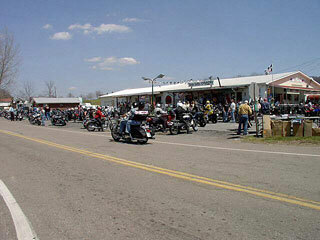 Fish Springs Marina is located at 191 Fish Springs Road, Hampton, TN 37658. 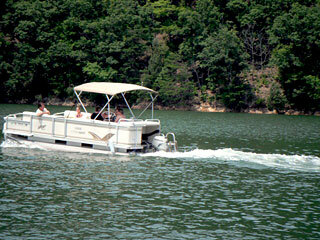 Call Tom at 1-423-768-2336 to reserve your boating day on Watauga Lake. Watauga Lake House – A Vacation Home on Watauga Lake, Tennessee is available for your week long vacation or long weekend getaways. 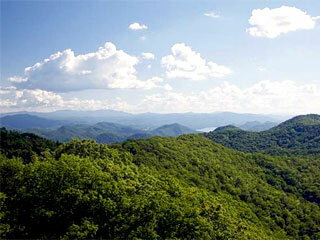 The Cherokee National Forest is your destination for outdoor recreation. Enjoy a scenic drive through the mountains, the pursuit of wildlife, the thrill of whitewater, a night under the stars, or solitude on a backcountry trail. 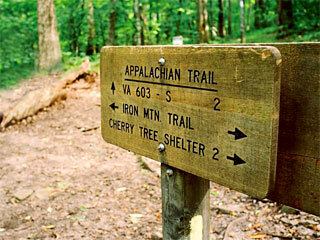 Over 600 miles of non-motorized trails traverse Cherokee National Forest including nearly 150 miles the Appalachian National Scenic Trail. The Cherokee National Forest is home to about 1,500 black bears, but only a few lucky guests will catch a glimpse of one of these reclusive animals. View the Cherokee National Forest Map. 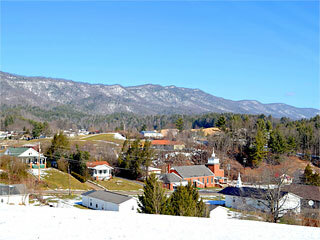 The Virginia Creeper Trail is a 34.3 mile rail to recreation trail starting in Abingdon VA and ending at the Virginia North Carolina state line. The Virginia Creeper Trail was completed in 1984 and is maintained by public and private partnerships between the U.S. Forest Service, towns of Abingdon VA and Damascus VA, and ‘Virginia Creeper Keeper’ trail volunteers. For Bike Rentals in Damascus VA, visit The Bike Station. Call 1-866-475-3629 for more information. 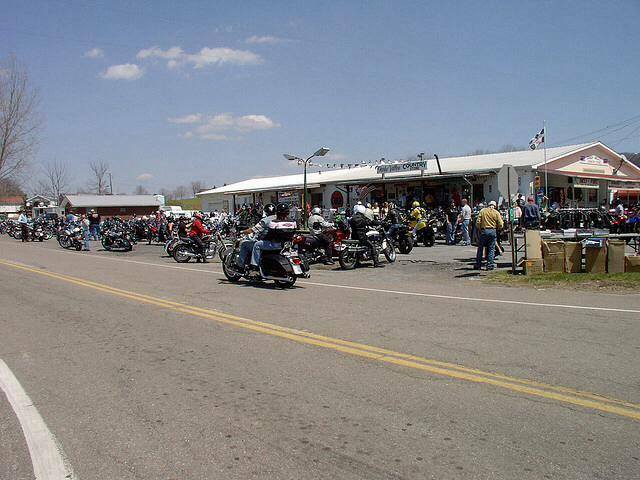 Ride “The Snake”, aka Highway 421 – 33 miles, 489 curves, 3 mountains, and 1 valley. The Snake is famous for its curves between Shady Valley, TN and Mountain City TN. The mountain scenery is great, but be sure to concentrate on the road. Check out the The Snake for more information. 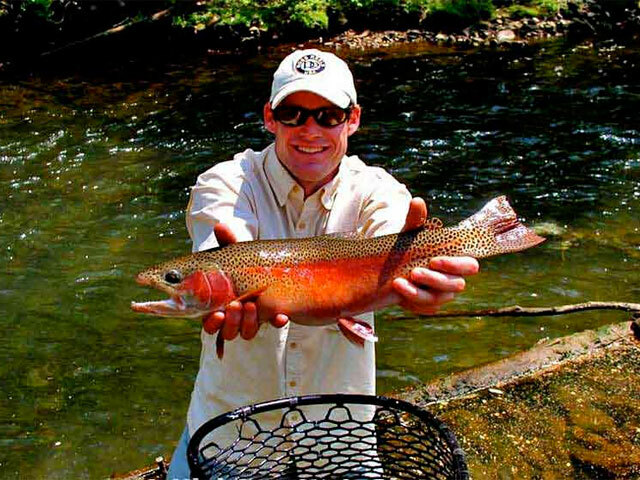 High Country Angler provides a helpful guide service with exceptional prices as well as the finer elements. Whether you are a beginner who needs to understand basic entomology, casting or even help identifying the fish you catch, we are here to help you during your fishing trip. Our goal is to make your trip one to remember. High Country Angler is located at 1400 Kensington Place, Johnson City, TN 37615. Call 1-704-641-6815 for more information. Enjoy 18 holes of golf on one of the country’s most beautiful golf courses – RedTail Mountain Golf Course. Sam Adams, golf pro, offers a challenging course where the ball flies forever. Tournaments throughout the Golf Season, depending on the weather. If you want other Golf Course suggestions, just give us a call. There are many fine Golf Courses in the area that welcome guests from ‘away’. 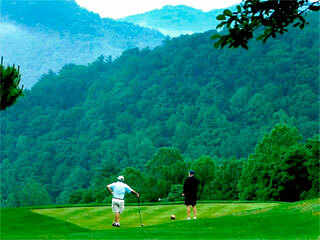 RedTail Mountain Golf Course is located at 300 Clubhouse Lane, Mountain City, TN 37683. Call 1-423 727-7600 for more information. Bristol Motor Speedway in Bristol TN, is a 160,000 seat race track which holds many fast paced racing events throughout the year. 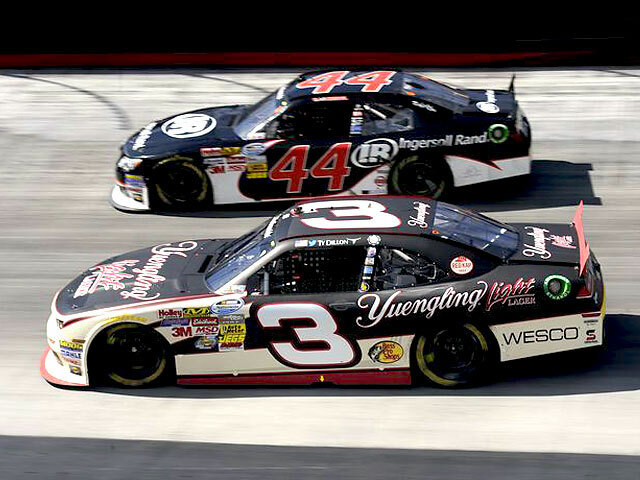 The Bristol Motor Speedway is just 42 miles from The Iron Mountain Inn Bed and Breakfast. 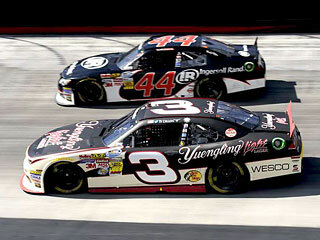 Bristol Motor Speedway is located at 151 Speedway Blvd, Bristol, TN 37620. Call 1-423-989-6900 for ticket and race information. 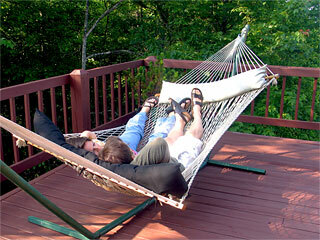 The Iron Mountain Inn Bed and Breakfast is located near many beautiful mountain waterfalls. View the Waterfall Information and Maps. View the Watauga Lake Area Map for Waterfall Locations and Directions. The Blue Hole – Cold, very beautiful and small swimming hole, never crowded. A primo swimming hole! Small, beautiful rocky gorge with cliffs as high as fifty feet with several cascading pools. Blue Hole is approximately 40 ft. by 30 ft. and estimated to be 15 ft. deep at its deepest point. There is a 20 ft. cliff adjacent to it where people jump off into it. GPS: 36.4362° N 82.0767° W.
Backbone Rock and Falls – Somewhat shallow swimming / water play place in National Forest Campground and Recreation Area. Located near ‘The World’s Shortest Railroad Tunnel’ and Backbone Falls. GPS: 36.594° N 81.814° W.
Laurel Fork Trail to Falls – There is a trail head at the east end of Hampton on Hwy 67/321 by the bridge and the river. 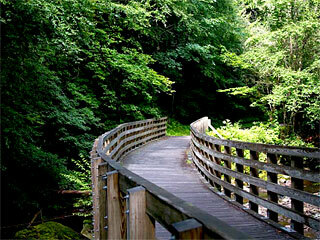 The trail follows a scenic gorge along Laurel Fork creek to Laurel Falls. There are several swimming places, both in the creek and at the falls. The hike is about 3 miles, round trip. 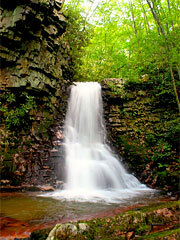 GPS: 36.27278° N 82.135° W.
Gentry Creek Falls – The hiking trail crosses the creek 13 times. There are four log bridges. Gentry Creek Falls are actually two different falls, each about 30’ high. GPS: 36.54222° N 81.72416° W.
Poga Big Falls / Twisting Falls – Twisting Falls is an impressive site. 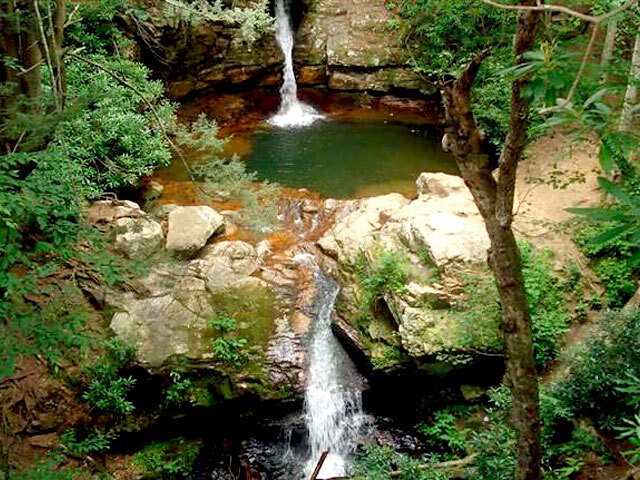 Swimming holes located at the top and bottom of a 30–40 foot waterfall. You can slide off the waterfall and take a 30 foot plunge into the lower pool. The upper pool is lined with cliffs where people can jump from heights ranging from about 10–40 feet. GPS: 36.2309° N 81.97517° W.
Elk Falls – This waterfall is easy to find. Elk Falls, also known as Big Falls, is a waterfall of extremes. It is 50’, with a high volume of water, it drops almost vertically into a huge, neat pool surrounded by massive rock bluffs, which is quite scenic and photogenic. GPS: 36.1906° N 81.9706° W.
Barter Theatre draws patrons from around the globe every day to Abingdon VA to enjoy the magic of live entertainment. Barter, the State Theatre of Virginia, helps visitors make memories through its talented cast of resident actors in shows ranging from comedies to dramas to musicals. A multitude of famous actors such as Ernest Borgnine got their start in Barter plays, and today the theatre continues to launch stars from its stages. Come and experience Barter Theatre for yourself. 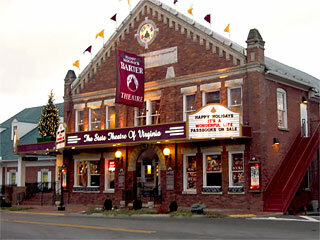 Barter Theatre is located at 127 West Main Street, Abingdon, VA 24210. Call 1-276.628.3991 for more information. 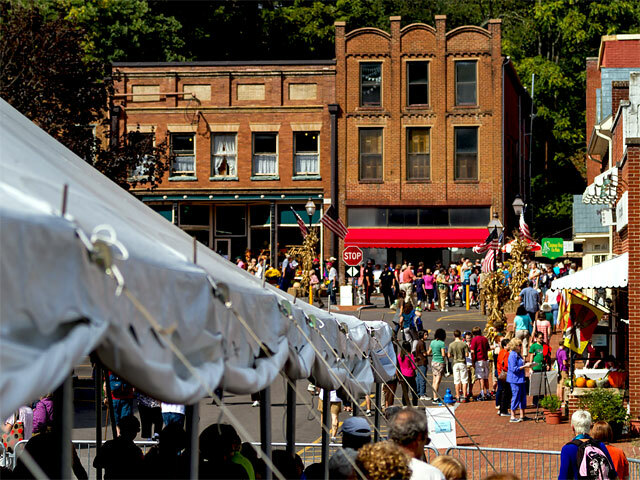 National Storytelling Festival in nearby Jonesborough, TN is an organization dedicated to inspiring and empowering people across the world to accomplish goals and make a difference by discovering, capturing, and sharing their stories. The National Storytelling Festival is held the first weekend in October. International Storytelling Center is located at 116 W. Main St, Jonesborough, TN 37659. Call 1-800-952-8392 or 1-423-753-2171 for more information. 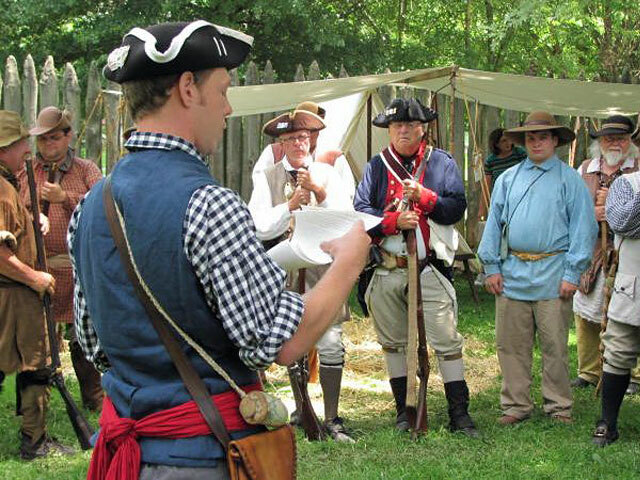 • Reenactments of Revolutionary War times. • Camp and march with the Overmountain Men in September as they plan the assault on Kings Mountain. • Quilt and art exhibits. • The Wataugans – An outdoor drama the last three weekends in July. Tells the story of the settling of the First Frontier and the battles with the Indians. 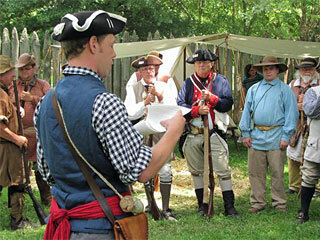 Sycamore Shoals State Park is located at 1651 W. Elk Avenue, Elizabethton, TN 37643. Call 1-423-543-5808 for more information. Butler Tennessee is a small mountain community in Johnson County in the Northeastern corner of Tennessee, near Watauga Lake. The settlement of Butler Tennessee began in 1768. Butler Tennessee was originally known as Smith’s Mill for the gristmill that Ezekial ‘Zeke’ Smith built on the bank of Roan Creek in 1820. After the Civil War, it was renamed in honor of Colonel Roderick R. Butler of Johnson County, who then represented the area in the state legislature and had been a commander in the 13th Tennessee Cavalry in the Union Army. ">The Butler Museum is located at 123 Selma Curtis Road, Butler, TN 37640. Call 1-423-768-3534 or 1-423-753-6961 for more information. After a hike on the Appalachian Trail or a day of boating on Watauga Lake, it’s time to enjoy the two person hammock on the Inn’s deck. Here you will enjoy the sound of bird song, wind in the trees, and getting onto ‘Mountain Time’ instead of ‘City Time’. Book Direct and Save Fees: 1-423-768-2446. Our rates are always lower than those you find on VRBO, AirBnB, Trip Advisor,etc., so be sure to “Book Direct” – Call Us at 423-768-2446 9:00 am to 8:00 p.m. We like to get to know you and you want to get to know us, or Book Online. Find the room you like, put in your dates and reserve your stay. GPS Address is 176 Moreland Drive. 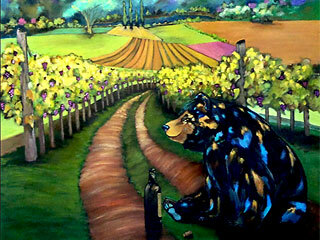 Look for the carved wooden bear sign with his sack on his back. ©2019 Iron Mountain Inn Bed and Breakfast in The Appalachian High Country. All Rights Reserved. 268 Moreland Drive, Butler TN 37640.